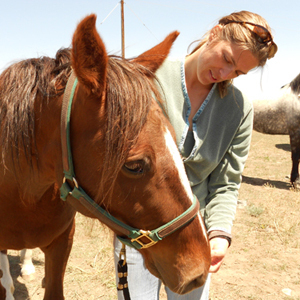 Dr. Kelly Keeney graduated from Colorado State University’s College of Veterinary Medicine, in Ft. Collins, in 2008. After graduating, she spent two years working in an American Animal Hospital Association (AAHA) accredited small animal hospital in Portland, Oregon. Quickly after beginning her career as a veterinarian, Dr. Keeney became drawn to learning about holistic approaches to healing patients. She soon became certified in Traditional Chinese Medicine & Acupuncture after studying with Dr Huisheng Xie, DVM PhD, of the Chi Institute in Florida. Dr. Keeney's passion to practice holistic veterinary medicine led to the opening of her practice, Mandala Integrative Veterinary Care, in her native Boulder, Colorado, early in 2010. Dr. Keeney is currently pursuing a Graduate Diploma in Western Veterinary Herbal Medicine. She is also certified in Rocky Mountain Field Botany and Wildcrafting, enabling her to make more of her own medicines and individual formulas for patients.